Thousands of visitors filter through the National Bonsai & Penjing Museum entrance gates and gardens every year, but few know the significance behind the design. Jack Sustic, who served as the Museum curator for 13 years, says before the Museum first opened in 1976, the entrance was only an open area with no gates or gardens. Today, visitors are welcomed into the Museum through the Ellen Gordon Allen Garden. In 1956, Ellen Gordon Allen created Ikebana International, a non-profit organization dedicated to preserving and spreading the art of ikebana, or Japanese flower arrangement. Allen established the organization’s first U.S. chapter in D.C.
“She’s quite important in the history of ikebana, especially in the United States,” says Sustic. The design of the garden, engendered by Thomas Wirth at the Susuki Association in Massachusetts, was named in honor of Allen’s contributions to ikebana. The garden was officially dedicated to Allen in 1982. 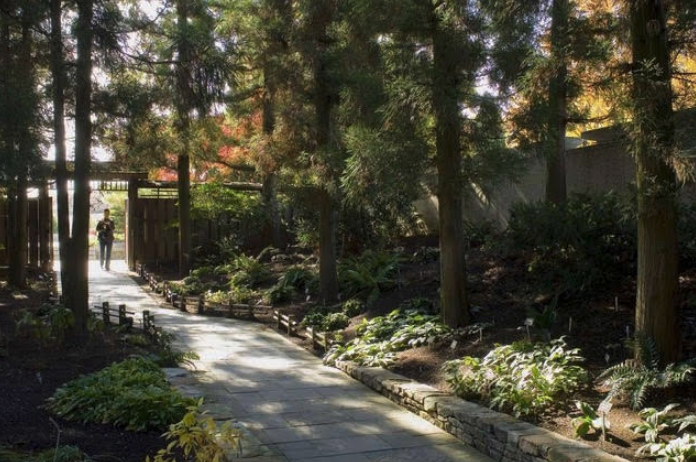 Constructed by Shimizu Landscape Corporation, based in Maryland, the garden melds the Western style of a national art garden with the traditional traits of an Eastern bonsai museum. Its large straight walkway represents a Western approach, which complements the Eastern-inspired sculpted tines within the garden. Sustic added that the entrance gate’s shingle roof and bamboo emulate a unique Japanese style not seen other places in the Arboretum. Sustic says visitors often appreciate the dedication and work incorporated into both cultures in the design. Enhancements to the entry gardens and gates have been minimal since the original design, enduring only a transition in plantings or an added lantern to improve the look. 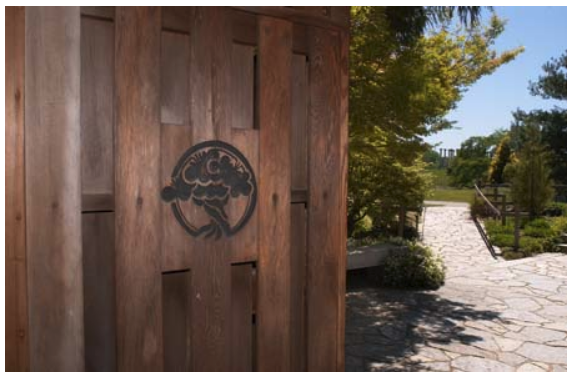 Visitors’ last steps to the Museum are taken on a walkway lined with cryptomerias, a Japanese cedar tree, believed to have a cleansing effect, which often surrounds Japanese temples and shrines. Sustic says this design is intentional and meant to transition visitors into a more meditative state of mind.